Anonymous is seeking to involve as many people as possible in its "war on Islamic State" as it publishes a series of guides to help people to identify and attack websites and social media accounts of ISIS online. In the wake of the terror attacks in Paris on Friday, Anonymous vowed to hunt down those responsible and expose them, calling Operation Paris (or OpParis) "the biggest operation ever" against the extremist group. Earlier this year, an offshoot of Anonymous called GhostSec began tracking Twitter accounts associated with ISIS in an attempt to weaken their ability to spread their propaganda online. The group is currently collecting Twitter account details from its followers before verifying them "by trusted individuals" and then passing them onto the authorities for surveillance. 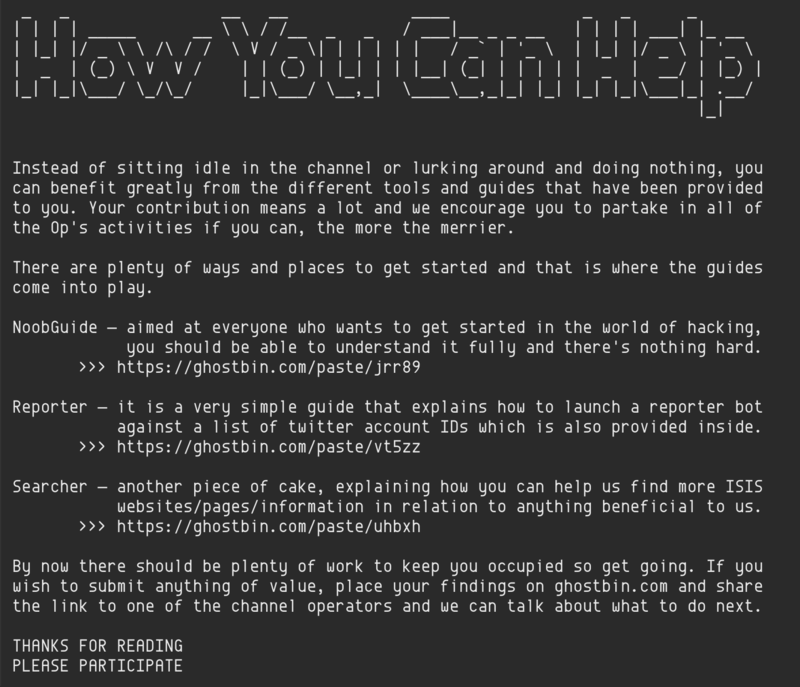 To help this effort the group has created a trio of guides, with the first, dubbed "The Noob Guide" being aimed "at everyone who wants to get started in the world of hacking" and promising that the instructions are easy to understand. "Your contribution means a lot and we encourage you to partake in all of the Op's activities if you can, the more the merrier," the group says. The guide itself first gives some tips for newbies, including learning some HTML and even some Python programming language, before starting out. It then suggests you use the Linux operating system recommending three flavors (or distributions) of Linux to use. The guide then speaks about protecting your anonymity, including the user of the Tor browser and virtual private machines (VPNs). Next, the group gives users a list of hacking tools that they can use without needing in-depth coding or computer knowledge. These include tools for carrying out distributed denial of service (DDoS) attacks, cracking passwords, scanning websites for vulnerabilities and man-in-the-middle attacks. The guide says that while "'hacking' is a broad term. There are many aspects to it, most of which require several programming skills, but that shouldn't stop you from using the tools made available by the Internet for you to take advantage of." The second guide published by Anonymous as part of OpParis is called the "Reporter Guide" and is not aimed at journalists, but is "a very simple guide that explains how to launch a reporter bot against a list of Twitter account IDs," with the guide also linking to a list of over 5,000 Twitter accounts that are called "primary targets." Anonymous says it has modified the reporter bot (a software application that runs automated tasks over the Internet) to report Twitter account IDs rather than usernames as this allows them to keep track of users who change their usernames often. The instructions for using the Reporter bot are relatively straightforward though the software won't work on the Mac OS X operating system and those using Windows will need to download Python. Finally, Anonymous has published a "Searcher Guide" aimed at helping those seeking to identify ISIS-related websites, though the group says it wants people to report the website centrally rather than attack them individually.